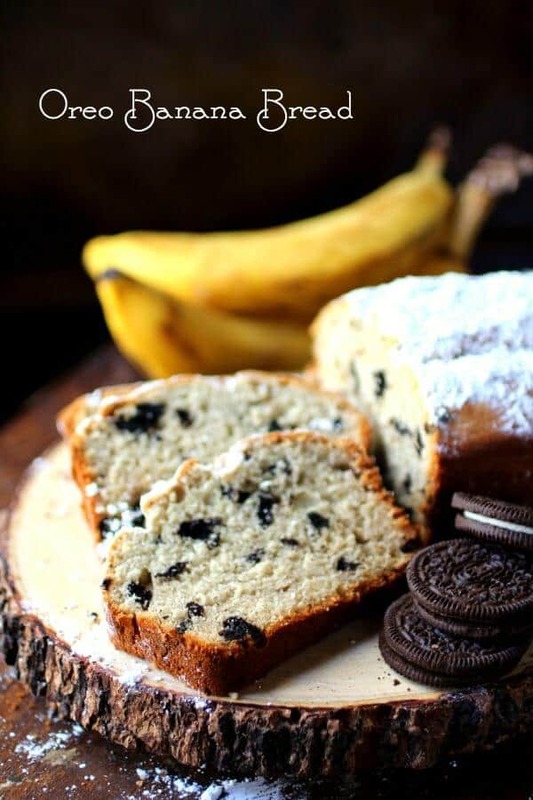 You’ve never tasted anything like this easy banana bread recipe with Oreos! Chopped Oreo cookies are stirred into a moist banana bread batter. It’s cooled then thickly dusted with Confectioner’s sugar. Each bite is bursting with ripe banana flavor and Oreo! Who doesn’t need more Oreos in their life? 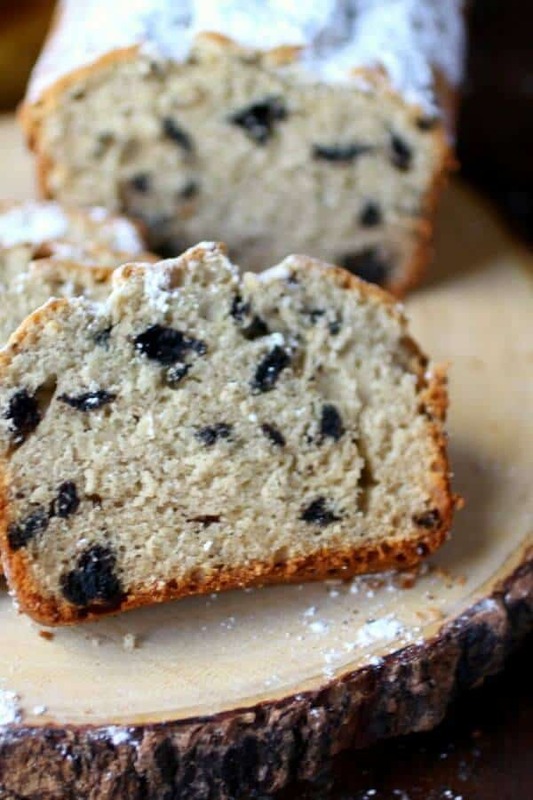 If you are in a hurry click here to go straight to the easy banana bread recipe! Banana bread is one of those foods that almost everyone loves – and why not? It’s sweet, tender, and full of yummy banana flavor plus it’s easy to make. I’ve made several variations of my banana bread recipe over the years. Pecans and chocolate chips have been added at times and at other times I’ve added raisins, toffee bits, or some other easy ingredient. I don’t know what made me think to add chopped Oreos but I am sure glad that I did. The Oreo cookies give you little explosions of chocolate in every bite while retaining some of the texture and flavor of an Oreo. The oil keeps this easy banana bread recipe moist for days — if it lasts that long! It’s an unusual bread and, while I’m sure it’s been done before by someone somewhere, I haven’t seen anything like it before..
My kids refuse to eat bananas once the little brown freckles appear. While I think that it’s the very best time to eat a banana my kids consider them “gross”, “slimy”, and “too ripe”. On the other hand, I won’t eat them until they’ve had a few days to ripen and for the sugars to develop. Since I am usually sticking to a low carb diet and therefore foregoing bananas altogether we generally have some in various stages of overripe. My kids will want to eat a particular food for weeks on end. It might be bananas or apples or clementines. Could be broccoli or asparagus. Then, all of a sudden (and usually when I have stocked up on the item) they just can’t bear to look at whatever it is let alone actually consume it. I don’t know. Do any of y’all’s kids do that? My older four weren’t fussy eaters. When they were growing up we had a lot less money and fewer options. Cereal, fresh fruit, and other “non-essentials” were seldom on the grocery list. Things have been so much better for the younger four but I wish their tastes were a little more predictable! This loaf cake keeperkeeps quick breads fresh plus, since it’s clear, you don’t forget about it until it’s grown blue hair. Here’s that ultra moist banana bread recipe! Tender, rich banana bread with chopped Oreos in each bite. 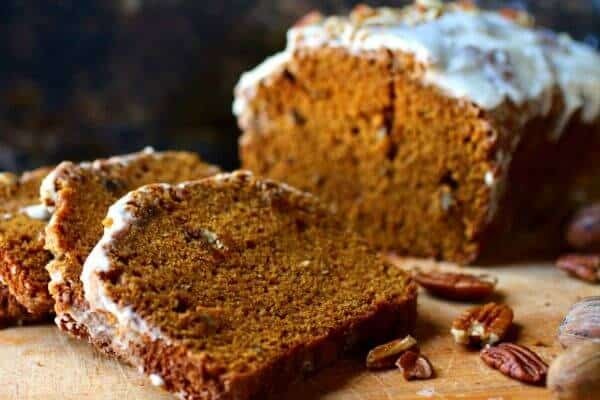 It's decadently moist with lots of ripe banana flavor. It's the perfect grab and go breakfast, afternoon snack, or late night munchie. Make it in mini loaf pans to give as gifts. Add the chopped Oreo cookies and gently blend into the batter. Spoon into two greased loaf pans and bake at 325f for 1 hour and 15 minutes or until a toothpick stuck into the center of a loaf comes out clean. Cool in pans for 15 minutes then turn out and finish cooling. Heavens I’ve never heard of banana bread with Oreos! That may be my new obsession! oh this bread would get me in trouble. I’d love to have a slice, or 2! What a great idea, Marye, I love chocolate with bananas. 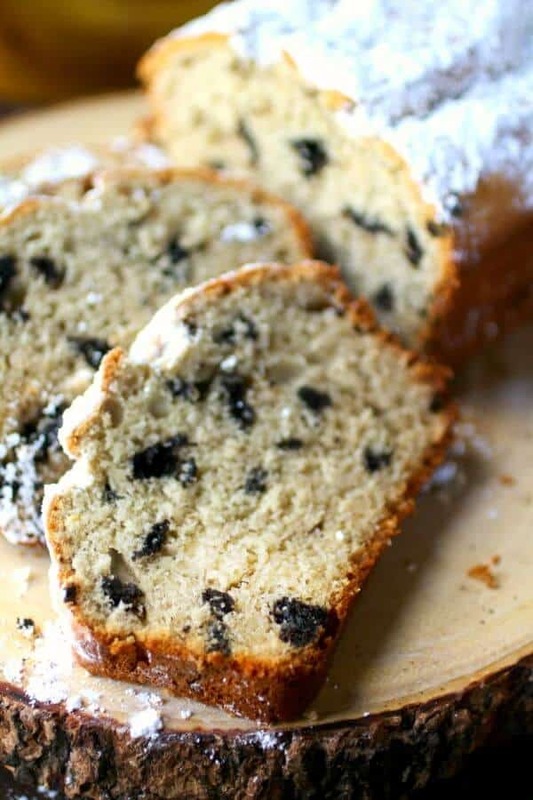 This bread is moist and chock full of Oreos! What a fun idea! Chocolate and bananas are a match made in heaven, I don’t know why I didn’t think of Oreos sooner! My husband loves oreos and banana bread. You just made the guy VERY happy with this recipe–I will be making for him!